More and more people are paying with credit cards and debit cards because it is convenient and you can collect credit card rewards miles/points. But before you pay your restaurant bill with your favorite card I recommend at least paying your tip in cash. Why pay in cash? It is very simple, when you pay with a credit card it is accounted for electronically and therefore Uncle Sam will almost always gets his cut. 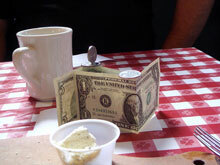 When you pay with cash it is not as easily traceable and therefore not all tips are reported. Before you scream tax fraud, let’s be real, a lot of people don’t claim 100% of the tips they collect to the IRS. This is not only true for waiters/waitresses but just about any service job that accepts tips like cab drivers, tour guides, hotel workers, etc. I’m not saying it is right but that’s just the way it is. Depending on their tax bracket you could be giving them a substantial bonus. Many people like to pay with credit cards and debit cards for convenience and for the rewards program. I do too, but if possible I like to just pay the food bill with a card and the tip with cash. I know my waiter or waitress will appreciate that. Just something to think about next time you charge your entire lunch or dinner. Here a the kicker, if you don’t like the service leave a smaller tip and pay your tip with your credit or debit card, hehe. Another place I like to pay cash is local mom and pop stores for the same reasons above. I am not promoting or suggesting tax fraud but believe me your favorite waiter or store owner will thank you. Any waiters or waitress want to weigh in on this one? I used to be a waitress and my husband also used to wait tables. And it is true that many don’t claim all their tips. I used to be a waiter. Unfortunately in Texas we were required to declare 15% on all credit card sales. But if you paid cash for the whole thing, well…cash is preferred! This really depends on the organization. My old workplace made assumptions (and paid taxes) based on your top-line sales. What this meant was that you paid taxes on your sales, not how much you made. As a result, a cash tip was not able to avoid taxes. This is a great eye opener for so very many people! Thank you for posting it. Being a waitress is a tough job, without a doubt. Different rules may apply to large corporate restaurants, however, the waitstaff at your favorite local restaurant relys on tips to make their living. I agree!!! Cash tips are better. My husband was not aware of this until I told him. Now he always leaves a cash tip unless the service was poor. Then he leaves a smaller tip and then the waiter/ess must claim it!!! Great to hear that coming from a fellow Hawaii resident. Thanks for the comment. Always tip cash at mom and pop stores.